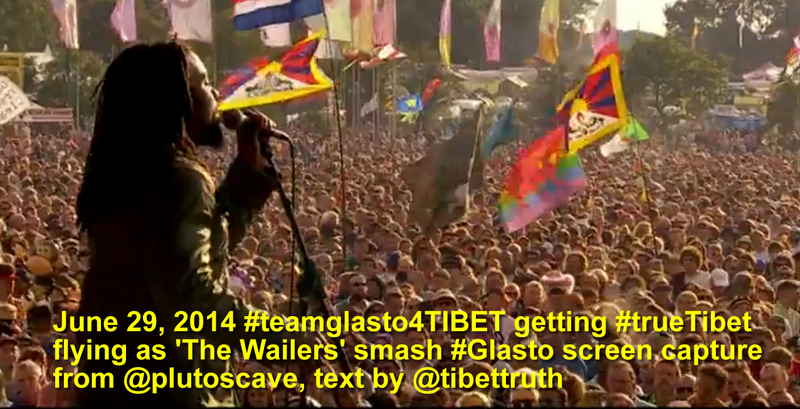 Has BBC Glastonbury Coverage Been Asked To Cut Out Shots Of Tibet’s Flag? According to our friends @Glasto4TIBET who are 24/7 monitoring live streams it looks like BBC camera ops @ Glastonbury festival have been given instructions to use tight shots of the crowd, interspersed with rapid cuts. This has the result of minimum exposure of flags being shown, especially from stage view into the crowd, those shots which do feature flags are mostly distance views or very quick snaps before cutting. Interesting. Could be fertile imaginings but after last year and especially the presence at the festival of the Dalai Lama, with the masses of Tibetan flags we got raised, it maybe a certain pressure was put upon the British Foreign Office. 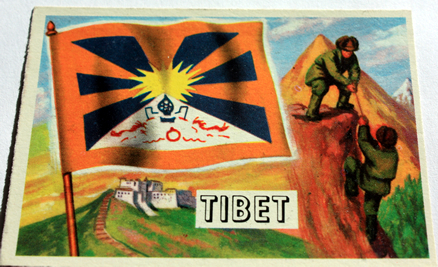 Which in turn requested support from its Establishment colleagues at the BBC to avoid any exposure of the Tibetan flag. Is it really just coincidence that on the BBC Glastonbury website there’s a short report on flags at the festival with the main photo showing…the flag of China’s regime?! So here’s the breakdown. The City Council Of San Leandro has had an ongoing debate on a proposal to honor China’s Regime by raising the Chinese flag at City Hall on October 1st, the date that saw the founding of the world’s most draconian and totalitarian (ooops sorry communist) state. Naturally this controversial plan attracted considerable opposition from within the local community and beyond, previously Council policy on flag raising invested the Mayor with the authority of final approval or not. This resulted in efforts to fly China’s flag last year being suspended by Mayor Cassidy. However at a Council meeting March 17 a motion was proposed to amend the wording of current policy which would remove from the Mayor any final say, with a decision reached via a Council vote, this is significant in that presently there seems a majority of Council Members who are determined to hoist China’s flag over City Hall. The proposal was carried by 4 to 3. Why then has the City Manager recommended staff to amend the existing policy? Moreover in so doing has he not operated beyond the duties and limits of his Office? We thought these questions, and others, demanded a response, so we emailed Chris Zapata on March 25, not having received a response a further communication was sent for his attention on March 29, See HERE unfortunately for whatever reason his office seems unable to respond. Curious don’t you think? Consulting local views on this we have been given to understand a form of political malaise hangs over City Hall and that such a lack of response is not to be considered unusual, if that’s the case it would be a worrying indictment of governance within San Leandro and we are reluctant to agree with some who claim that genuine democratic process and accountability is sadly absent from City Hall’s administration. We prefer to believe that good folk are working for the community, dedicated to and respecting the values of open and transparent local government, mindful of the importance of public participation and accountability. Such people will rightly expect that Council procedure follows agreed policy and protocol in accord with the City Charter, we wonder then how they would feel at a decision reached by the City Council which appears, in relation to the issue of amending policy on flag raising, not to have fully complied with such protocols? 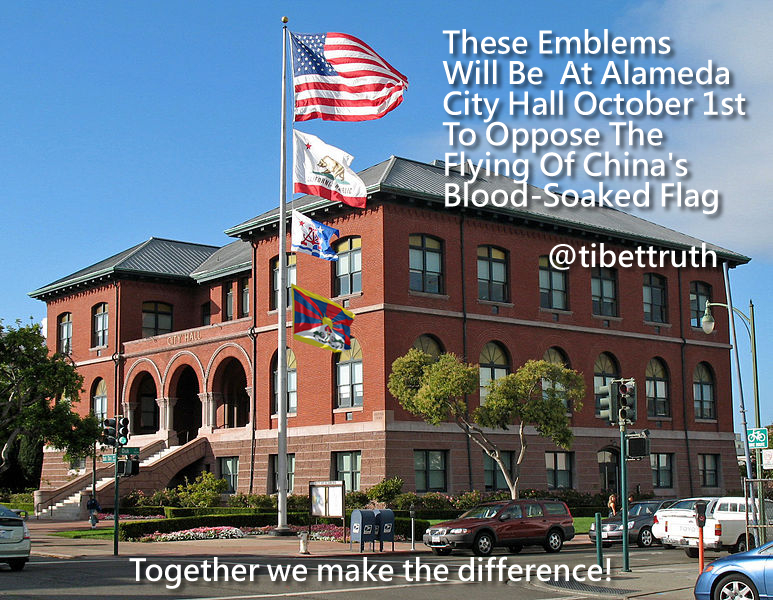 There are no doubt many questions surrounding this issue, not least of all why a majority of Council Members seem so determined to ignore the obvious ethical concerns at associating San Leandro with China’s Regime, and are working tirelessly to raise the Chinese flag at City Hall. More specifically however there are concerns if the recent decision to amend policy regarding this subject was determined in a genuinely democratic manner and in accordance with city’s administrative and procedural policies? To that end we present our own questions for the attention of the Mayor and City Council Members which we hope they may have the courtesy and goodwill to address. Will Mayor Cassidy and Council Members firstly acknowledge that the proposed amendments to wording of the current policy on flag raising (debated during the March 17 City Council meeting) was suggested by the Office of the City Manager? Will Mayor Cassidy and Council Members kindly confirm that they are aware that the powers and duties of the Office of City Manager do not extend to recommending amendments to policy? Will Mayor Cassidy and Council Members explain why they seemed to have based a Motion, to amend policy wording, upon a recommendation from a city official whose remit looks not to include the authority of suggesting policy changes? Will Mayor Cassidy and Council Members explain how the decision arising from the meeting of March 17 can be said to be in full accord with the City Charter and when local law seems to be silent regarding the City Manager’s role in advising the City Council on policy matters? Given the genuine concern within the local community on the prospect of raising China’s flag at City Hall, which has attracted attention far from the city limits and become of international interest to those supporting human rights, freedom and justice, and in light of the questions regarding the role of the City Manger relating to this people are understandably asking if City Council procedure or democratic process has been best served on this occasion? Therefore we would respectfully ask Mayor Cassidy and Council Members of San Leandro for a public discussion and full review of this issue to determine openly and fully if Motion 14-113 (Directing Staff to Amend the Existing Policy as Recommended by the City Manager, and Directing the City Manager to Develop Procedures for Reviewing and Processing Requests to Raise Special Designation Flags or Flags of Foreign Nations) can be shown to have been administered and determined in legitimate accord with the City Charter and protocols. San Leandro Do You Really Want To Ally Your City With Tyranny? We have now received a very informative and helpful response from Marian Handa, City Clerk of San Leandro addressing specific questions we presented on the recent City Council meeting on the subject of it’s flag raising policy. As we had also published these in the form of an open communication to inform our friends and subscribers, the detailed reply kindly provided by Marian may be read HERE It is featured to assist those who are actively concerned about the proposal to raise the flag of China above City Hall reach an informed understanding of the Council’s position and consequences of any amendments regarding this policy. One thing for sure certain Council members appear curiously determined to associate San Leandro with an emblem that goes far beyond culture, to claim as some have that the Chinese flag is a cultural representation has the same hollowness as asserting that the flag of the National Socialist Party Of Germany represented German culture! 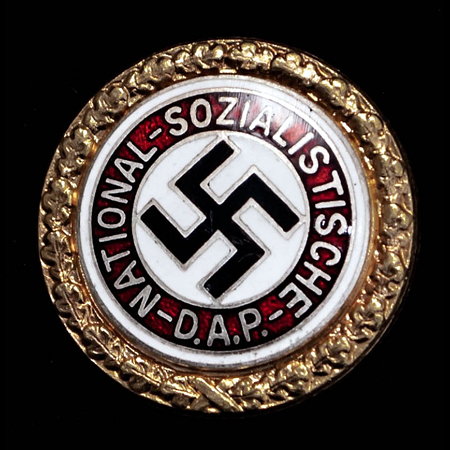 An Emblem Of Peace & Culture? 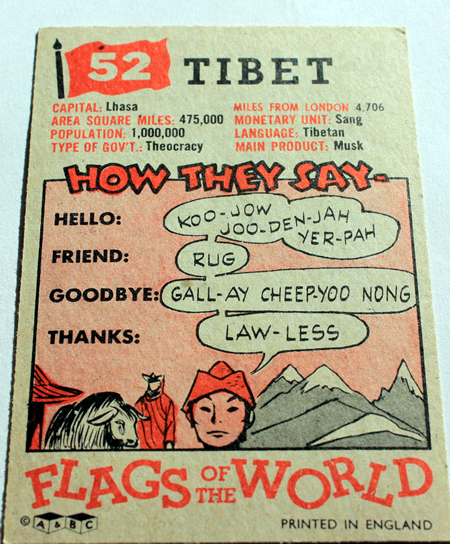 The procedural administration of City Councils of course vary and each operate according to agreed policy and democratically determined process, that was evident in the debate and public presentations of March 17,during which many Tibetans attended and gave powerful testimony as to why it would be unacceptable to honor China’s regime by flying the Chinese flag over City Hall. We wonder though how many folks at that meeting were aware that the recommendation to change the current flag raising policy seems not to have been drawn from open discussion with active and encouraged participation from the public but apparently was based upon the sole recommendation of San Leandro City Manager, Chris Zapata! Would San Leandro City Council Have Flown The Racist Apartheid Flag Of South Africa As An Emblem of Peace & Friendly Relations? Are we the only folks here to consider such a recommendation, if made by an individual, minus any consensual or open discussion and lacking public participation, runs counter to transparent, democratic process? On what basis did the City Manager decide to propose such amendments, was he lobbied by Council Members beyond public scrutiny? Perhaps this was an executive and non-accountable decision? Whatever the facts there are a number of questions raised. For example has Chris Zapata in setting out these proposals operated within the remit of his office? Does his administrative jurisdiction extend to drafting recommendations to alter wording of present policy? What authority does his office possess to propose policy changes? Would San Leandro City Council Have Flown The Genocidal Flag Of The Khymer Rouge As An Emblem of Peace & Friendly Relations With Cambodia? In removing from the Mayor final authority in any decision on flag raising, which the City Manager’s recommendations proposed, such a determination would be left to a vote of the Council. That was agreed during the meeting of March 17 by a majority of 4 to 3, so if such a position endures then in all likely-hood we can expect San Leandro at some future date to vote in favor of raising the Chinese flag at City Hall. We can only presume that the City Manager, in suddenly intervening in this fashion was very aware of such consequences, which will make some wonder as to the influences that may have operated behind the scenes. Clearly this issue is set to continue generating widespread concern at just what is going down in the city’s council? Are we really seeing an effort to serve local opinion on the matter, is this truly about acknowledging Chinese culture, or is it the tip of a much darker agenda? We are going to present such concerns to Chris Zapata, stay tuned!